Railroad ties are used for a variety of home landscaping purposes such as building a retaining wall, making a walkway, or framing a garden. Railroad ties are inexpensive and the wood is chemically treated to give it longevity. The most difficult aspect of working with railroad ties is their weight. Railroad ties are very heavy and not easily moved. If you are planning a landscaping project that involves railroad ties it is important to develop a plan and enlist the aid of several friends. This makes the job easier if you are buying new railroad ties or if you are rearranging those already at your home. Make arrangements to use a heavy-duty pickup truck. 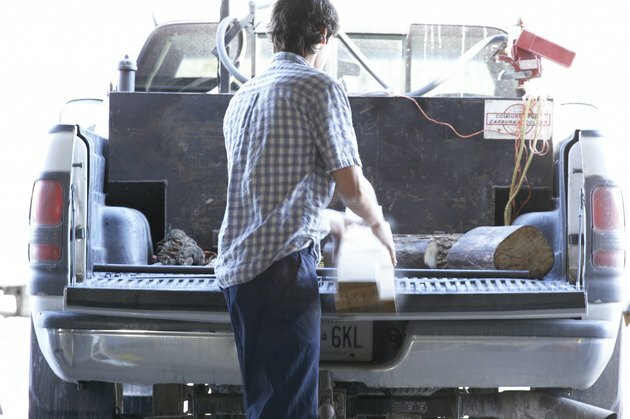 Trucks are categorized as half-ton, three quarters-ton, and one-ton. Railroad ties vary in weight from several hundred pounds to a thousand pounds. Determine how many railroad ties to carry in the truck. Make several trips If you are moving a large number of railroad ties. Enlist the help of several strong friends. Railroad ties are easier and safer to move when the weight is distributed among several people. Wear long sleeve shirts, long pants, steel-toe boots, and work gloves. Railroad ties are treated with creosote, which is a chemical preservative. A wound from a splinter can become easily infected. Load the railroad ties in the truck and take them to the site. Park the truck as close as possible to the location intended for the railroad ties. Carefully unload the ties and place them in the correct spot. Dig out the dirt from around the railroad tie with a shovel. The weight of the wood causes the tie to settle into the ground. Place crow bars under the railroad tie and pry it loose from the ground. Enlist your friends aid in this step as well to make it go faster. Pry the railroad tie upward while rocking it back and forth until it moves freely. Move the railroad tie to its new location. If you are simply rearranging the railroad ties lift it up, with the help of your friends, and place it at its new spot. If the railroad ties are being moved a longer distance, load them into the bed of the truck.